WE HAVE OVER 16 YEARS EXPERIENCE OF PROVIDING ACCESS SOLUTIONS FOR ACTIVITIES INVOLVING WORKING AT HEIGHT, WITHIN CONFINED SPACES AND IN AREAS OF RESTRICTED ACCESS. 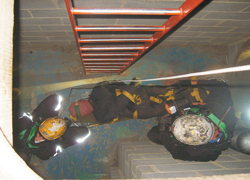 Access Direct Site Services Ltd has over 16 years experience of providing access solutions for activities involving working at height, within confined spaces and in areas of restricted access. Thorough confined space rescue training linked to the rescue techniques developed for the specialist working at height activities that we conduct has allowed us to develop rescue procedures that ensure the safe evacuation of injured personnel from any area of work to a safe zone where further medical aid can be administered. From small works cover to complete site logistics all Emergency Response Services are individually tailored to the clients and workplace requirements.